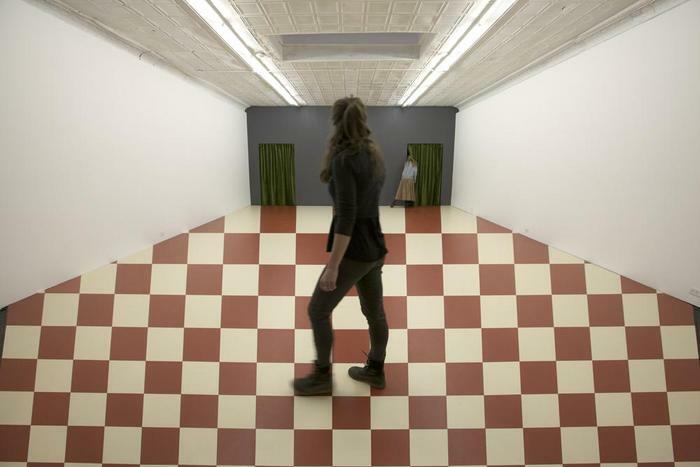 The red-and-white checked, anamorphic floor of Meredith James’s video installation Delmar, showing through April 13th at the Jack Hanley Gallery, primes viewers to expect a puzzle. The video triptych behind the green velvet curtains at the far end of the gallery doesn’t disappoint. As a form, the triptych can be traced from the painted altarpieces of the early Renaissance to modern films. Before the now standard use of widescreen in film, Abel Gance made use of a triptych format to expand the world of his epic Napoleon (1927). The technique, labeled “polyvision” by film critic Émile Vuillermoz, arguably inspired Mike Figgis to experiment with the chaos of split-screen, simultaneous storytelling in Timecode (2000). James’s Delmar, built around a play written by Julia Jarcho about two families living in a landlocked town, touches on each of these milestones. While the visuals, from forced perspective to architectural details, closely resemble the Early Netherlandish Mérode Altarpiece, the panels of James screen act more like the mirrored walls of a kaleidoscope, shattering the same finite set into what seems like a million walls, corners, rafters, credenzas, tables, candelabras, and multiplying them into a believable world that one imagines stretching in all directions beyond the borders of the screen. As in a kaleidoscope, there’s both a remarkable visual coherence and a chaotic fragmentation. At one moment the central panel contains two characters, siblings with matching outfits: the sister wears a red and white polka dot dress over a narrow-striped shirt while the brother wears a broad-striped shirt with a red polka dot neckerchief. The camera points up toward their faces and the squares of the coffered ceiling. The camera angle of the two side panels reveals that the room has a red and white checked floor that inversely complements the sister’s dress and mirrors the coffered ceiling’s tightly receding squares. All panels seem to show the same room, but there are differences between left, right and center. Left: portraits of the siblings wearing those same outfits hang on the wall. Right: a wooden bench rests beneath a window. Center: windows that don’t correspond to any windows in the other panels. Left: the right half of a door. Right: the left half of a door. Center: no door but a fascinating view out the windows. And just as your brain is beginning to piece the room back together, the scene is replaced by another and you’re forced to start over. In a nod to Jean Cocteau’s La Belle et la Bête, there’s a castle with human hands acting as wall sconces, and inhabited by actors from earlier scenes playing different characters (Spanish royalty). There’s a fake pond, a real ocean, and a goat pasture with distant mountains painted on the walls of a space-distorting Eames room—with real goats grazing in it. In less sure hands such split screen chaos could slip out of control, but James perfectly fits the complex pieces of her visuals with Jarcho’s script, in which each line meets the next from an odd angle yet creates a narrative whose perspective is as interestingly forced as that of James’s set.